This post is a follow up to Archer’s Bracers and Wooden Stamps (again) of the year before last. It’s mostly me showing off, with some self-justification to explain the decisions I made about dye colours and buckles. I started writing this post in September 2014, so forgive me if things seem a little outdated. I’m quoting from Gervase Markham’s The Art of Archerie (1634) here, mainly for my own convenience because I can cut and paste from the ebook. Markham was a publisher and like his peers, made his money from the sheer number of different titles he sold rather than the more modern approach of having fewer stronger selling titles. Accuracy, readability, veracity and respecting ownership of intellectual property were not his strong points. In this case, he’s written a new dedicatory epistle to the king, a new first chapter (A general encomion or praise of shooting both in peace and war) and then basically plagiarized the second book of Ascham’s Toxophilus when he thought everyone had stopped reading. He has modernised Ascham’s language somewhat and added the occasional paragraph of his own. This next bit seems to be Markham’s own work and reflects mid-17th century practice rather than 16th c, Ascham is silent on the appropriate types of leather. The bracers are made for the most part of Spanish leather, the smooth side outward, and they be the best, sometimes of Spanish leather and the flesh side outward, and they are both good and tolerable, and others are made of hard, stiff but smooth bend leather, and they be the worst and most dangerous, and thus much is spoken of the bracer. Cut the straps to the correct width to fit the actual or hypothetical buckle and punch the holes for the rivets and mounting the buckle. 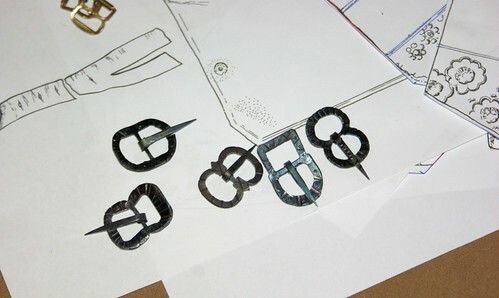 I used a thin 1.5mm carving leather for the straps on the commercial buckles and a 3mm on the ones I’d made. 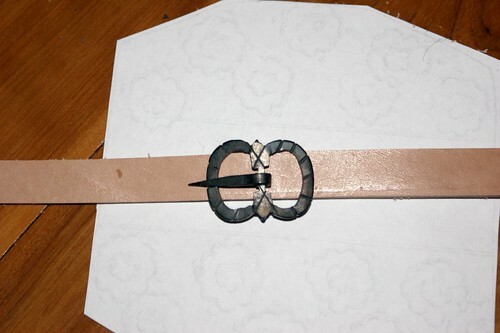 “Y” shaped straps can be made by splitting a straight strap for part of its length, dampening the branching area and then stretching and squeezing to shape. Dye the bits as required with your choice of leather dye. I used red on a couple to represent Spanish leather (the red colour came from a step in the tanning process), the majority are black or brown. My bracer has a forged buckle, but to show what you can do at home, I made these from a piece of 1.6mm sheet mild steel I’d picked up from the local hardware. The shapes are entirely hypothetical because none of the Mary Rose bracer buckles have survived. The holes have been drilled and then opened up with files. On some of the square ones, I stitch drilled and then cut the webs with a cold chisel. Decoration is with sharp or blunt cold chisels and a centre punch. The buckle tongues are horseshoe nails with the heads cut off and then bent to an appropriate shape. Don’t forget to clean and debur the front and back. The finish is a simple heat blue, a stable oxide of iron. I use a similar process to this, either using a propane torch or gas ring depending on what the gas bottle is connected to, but finish with a spray oil rather than a dip. Just do it outside and don’t breathe the fumes. You can blue in your oven if it can heat to 290°C/550°F. Assemble all the bits using copper harness rivets (the impressions in the leather match the Mary Rose examples) and wax or seal to taste.